The opening story, The Triple Knife, was previously published in the 2015 collection The Legends of Ashildr. The events depicted here were inspired by a discussion that took place in the episode The Woman Who Lived, which proved to be a particularly moving moment for Colgan. Though the Doctor does not appear in this tale, his role in Ashildr’s endless existence is keenly felt, and we get a clear understanding of why she hates him so much. The Triple Knife boasts the most powerful writing in this volume, effectively conveying the immortal’s tiredness of life. Clara and the Eleventh Doctor land on an unknown alien planet that’s not on any maps or star charts. What could be so terrible here that its existence has been erased…? The second story, Into the Nowhere, was originally published as part of the Time Trips series of ebooks in 2014. At 56 pages, it’s the longest entry in the book. Unfortunately, it is also the weakest. This was the author’s first Doctor Who short story, after her 2012 novel Dark Horizons, and she admits that because of this she attempted to throw everything she could at it, “including the kitchen sink”. The result is a rather muddled combination of imagery from fairy tales (most notably Clara’s red cloak) and the Bible (such as the Garden of Eden) – though I will admit that the creepy walking skeletons are highly memorable. The characterisation of the TARDIS crew is somewhat out of whack. The Doctor’s reaction to discovering a nameless and uncharted planet doesn’t seem convincing – he doesn’t want to go there, when you would think that the mystery of an unknown would excite him. Later, though, he is engaged by the enigmas on the planet’s surface. Clara is also ambiguous – does she actually like travelling with the Doctor? However, this is largely the fault of her bland characterisation in the television programme at the time, when she was more of a puzzle than a personality. Not much of a celebration of “the women of the Whoniverse”, then. Jenny T. Colgan certainly likes her Vikings. There were lots of them in Dark Horizons, an immortal one in The Triple Knife, and now we come to Picnic at Asgard. First published as part of the 2016 anthology The Legends of River Song, this tale was inspired by a throwaway reference to an entry in River’s diary in her debut episode Silence in the Library. 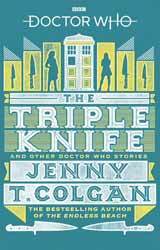 As with The Triple Knife, Colgan presents a mother’s point of view. Though River isn’t a parent, she is considering becoming one. This thought remains at the back of her mind throughout the narrative. However, this enjoyable get-together with the fun-loving Eleventh Doctor is never allowed to get serious for long, thanks to the wacky events going on around them. This is because the Asgard visited here is not the actual realm of the Norse god Odin but a planet-sized theme park, staffed by cute furry mammal personnel and frequented by families with sulky children. I think you’ll enjoy your visit. Clara joins the Twelfth Doctor for the final two adventures in this book, both of which hail from 2015. In a way, All The Empty Towers is the opposite of Picnic at Asgard, in which River wants to be serious for a moment and yet gets a light-hearted holiday thrust upon her. Here the Doctor’s companion is expecting and hoping for an enjoyable day trip, but the experience is far from it. This story originally saw print in The Scientific Secrets of Doctor Who, and it tackles the topic of climate change. It does so in its own eccentric style, featuring deadly cyborg landladies and a devoted donkey, so the tone is far from preachy. “Looks like all those Bags for Life you bought didn’t quite do the trick,” says the Doctor drily. He reminds Clara that time can be rewritten – in so doing telling the reader that it’s not too late to avert Blackpool’s fate, or that of the planet as a whole. The characterisation of the Twelfth Doctor is particularly impressive here, since at the time of writing the author had not yet seen Peter Capaldi play the part. She successfully conveys his grumpiness, including the fact that he often has more empathy for animals than he does for beings that walk on two legs. When the Doctor takes a tumble out of the TARDIS and plummets towards a planet’s surface, will Clara be able to rescue him…? A Long Way Down is another entry from the Time Trips series of ebooks. It was also published in sections on the fold-out dust jacket of the print omnibus. Somewhat spookily predicting the post-regeneration peril that would befall his successor, the Twelfth Doctor slips through the open doors of the TARDIS to seemingly certain doom. At just seven pages, this is the shortest story in the book, and is necessarily simplistic. The time-travel complexities are unconvincing (I can see how the TARDIS’s time shifts would create duplicate TARDISes and Claras, but not duplicate Doctors and delphiniums). Fortunately, the brevity of this entertaining escapade means that it doesn’t outstay its welcome. The whole “women of the Whoniverse” angle of this collection seems a tad forced, especially given the fact that three of the stories feature the same woman. Nevertheless, as the author says in her intro, it’s good to get all of Colgan’s short Who fiction together under one cover.